Procrastination is all about putting things off to a “better” time which – of course – never quite comes. And we all do it at times, regardless of how well organised and efficient we may otherwise be. That job – or jobs – big or small, we’d prefer to put off until tomorrow. Or, even better, the day after (!). On one hand this seems like a good strategy as it leaves time for us to do those things we prefer to do. Or, even better, actually enjoy. However, the downside of this, is that there are only so many things we can do “later”, whenever later may be. So, really, we’re just causing more problems for ourselves. Not forgetting how draining it is to keep ignoring the “elephant in the room” which we haven’t quite got round to dealing with. Added to this, is the true paradox of procrastination. This is that, more often than not, much more time is taken up in procrastinating than the job itself would take. And, for some reason, it often seems to be the relatively quick – or simple – jobs that we end up procrastinating about the most. The quick answer is that it’s all about resistance. Something we don’t want to do. And there are many reasons why we don’t want to do it. Perhaps it’s something we don’t enjoy doing. Somehow by putting it off, the logic goes, it’ll be easier or less painful to do at some unspecified date in the future. Or we’re not sure that we can do it – in other words don’t feel confident to do it – so end up dithering and putting it off to a “better” day. Well, as so often is the case, there’s a very simple solution to this problem. And one we’ve used for years. Whatever it is that you don’t like doing – or tend to put off – do it as your first job of the day. Not only will it get it over and done with, but you’ll feel great for the rest of the day. Even better, you’ll usually find that it takes a fraction of the time – and effort – you expected it to. Phew! 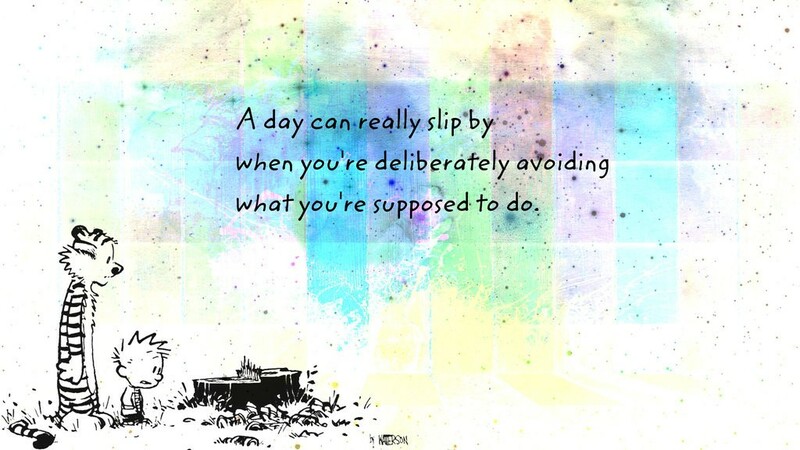 And, as an added bonus, it makes everything else you do that day seem like a piece of cake. If this is too simple for you, here’s another tactic we recently heard about. It’s brilliant, particularly for children, but you can use it yourself too. Having to give a definite later time of when it will be done, instantly thwarts the plan of never doing it at all. It stops “later” becoming “never”. And, if you have a specific time in the future looming over you, it suddenly becomes so much easier to do it now. To get it over and done with. If this doesn’t happen, the definite future date gives you some time – between now and that definite time – to do any necessary preparation to make the whole job much easier. So, when that time comes, the whole thing is accomplished more easily.